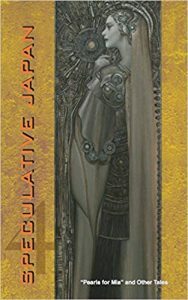 Speculative Japan 4 is an anthology of SF and fantasy (and horror) from Japan – some recent, some from decades ago. 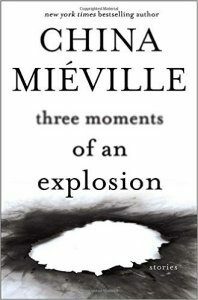 Most of the stories are of a distinctly different flavor and focus than most recent anglophone SF, and different from, for example, the Chinese SF that we have seen a great deal of recently. 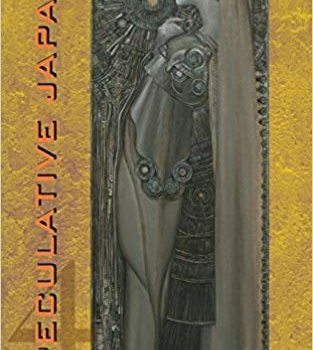 Perhaps it’s not a surprise, then, that the story I liked best, “A Fish in Chryse” by Azuma Hiroki, is the most traditionally plotted, and traditionally described, SF story in the book. In the 25th century, Akito, an 11-year-old Martian colonist, impulsively runs from his tour group with Marisa, a 16-year-old tour guide, for a while. He becomes obsessed with her and they keep in contact in an unusual way for years, writing physical letters, and meeting occasionally and becoming closer. But there is something strange about Marisa, and over time we learn that there is a time of crisis coming to the solar system, engendered by the discovery of alien tech which will lead to instantaneous travel between worlds. Akito is in love with Marisa, and perhaps she with him, but she has a different destiny in mind. The plot structure is familiar, and so is the somewhat melodramatic resolution, but it’s an entertaining and, in its way, refreshing story.